Chuck Bartowski, ace computer geek at the BuyMore, is not in his right mind. That's a good thing. Ever since he unwittingly downloaded stolen government secrets into his brain, action, excitement and a cool secret- agent girlfriend have entered his life. It's a bad thing, too. Because now Chuck is in danger 24/7. Executive producers Josh Schwartz (The OC, Gossip Girl) and McG (Charlie's Angels, We Are Marshall) merge techno-gadgetry, ma.. The secret's out! 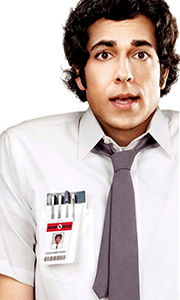 Chuck is back for his biggest mission yet: reuniting the Bartowski family. This season, Chuck's search for his mother takes him beyond the Buy More and across the globe in 24 action-packed episodes. Back in Burbank, his best friend Morgan is the CIA's newest recruit, training with the surly Colonel Casey, while Chuck's relationship with superspy Sarah Walker is getting serious. But whether Chuck is outwitting assassins..
Chuck is back with new missions, a new business - and no Intersect. The stakes are high as Chuck sets out to become a full-fledged spy. But without the CIA as backup, Chuck will have to rely now more than ever on John Casey, Sarah Walker, and a new Intersect - Morgan Guillermo Grimes. Across this thrilling final season, Chuck will find that his wits, his friends and his family are the only backup he needs. Special Features Sandwiches A..